This is a few inches tall, with purplish stems, which are so very slender and wiry that they look hardly thicker than hairs and the flowers seem to be hovering in the air, giving an exceedingly pretty and delicate effect. The leaves are stiff and dark green and the flowers are half an inch or more across, with a yellowish tube and white petals, delicately veined with blue, with a pale yellow pistil and orange anthers. This grows on the dry tops of mesas, in southern California. 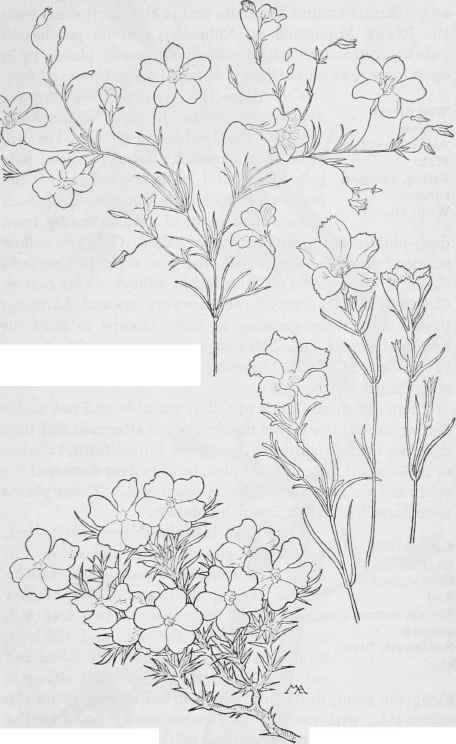 There are many kinds of Phlox, natives of North America and Asia, usually perennials, the leaves toothless, mostly opposite, at least the lower ones; the calyx five-ribbed; the corolla salver-form; the stamens inserted very unequally in the tube and not protruding; the seeds not mucilaginous. The salver-form corolla and the seeds not being mucilaginous distinguishes Phlox from Gilia. The name is from the Greek, meaning "flame."